Hello and Happy Tuesday! I sure hope your week is off to a wonderful start! There are sooo many sick people here in Tennessee! One of my best friends has the flu and some of the schools have even closed for a few days because of sickness and especially the flu! I hope you are staying well.. washing your hands and trying to stay away from sick people. I know that's easier said than done! 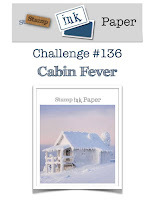 This week's challenge over at Stamp, Ink, Paper is one I'm really feeling.. Cabin Fever! We are all ready for Spring I think and ready to thaw out! So when I think of Cabin Fever, I think of getting outside in Sunshine.. so that brought me to a fun stamp and die set by Concord & 9th that I have hardly used.. Sunshine Turnabout! I used Stampin' Up Inks to ink up the fun turnabout stamp in Peekaboo Peach, Daffodil Delight, and the retired Strawberry Slush in both full strength and stamped off. I used some circle dies to cut out my Sunshine rays. The center was cut from Peekaboo Peach Cardstock. I stamped the sentiment "you make everything shine" in Peekaboo Peach Ink twice and then stamped versamark over it and clear heat embossed it. Since I felt like the embossed sentiment looked more orange than peach, I used a strap piece of SU Pumpkin Pie cardstock to cut out the scallop to surround the circle. The flowers were stamped on Whisper White with the same colors that I used for my turnabout stamp and the leaves were stamped in SU Wild Wasabi. I used the coordinating dies to cut out the flowers and leaves and arranged them around the sentiment. I really felt like this stamped panel was calling for a square card so I cut a piece of Thick Whisper White Cardstock 8 1/2 " 4 1/4" and scored it at 4 1/4" for a small square card. I cut a piece of watercolor look pink patterned paper from Altenew 4 1/4" x 4 1/4" and used Tombow to adhere it completely to the front of my card base. I ran a piece of white organza ribbon across the front and tied it in a bow on the far left of the card. I attached my circle with Dimensionals over the ribbon. Two of the flowers had glittered enamel dots by Stampin' up! as centers. The other flowers had Lucy's Little Things Rainbow Jewels as centers. I finished the card off by adding a few more of the Rainbow Jewels onto the card front with Ranger Multi Medium Matt Adhesive. I'm loving the square card.. I see more of these in my future!